← Former FCC Chair Wants to Know Why 5G Isn’t Secure. Still Doesn’t Care That 5G Radiation Exposure Isn’t Safe. The military isn’t about to deploy its pain ray to the battlefield. But someone in the commercial sector is about to one. We don’t know who. 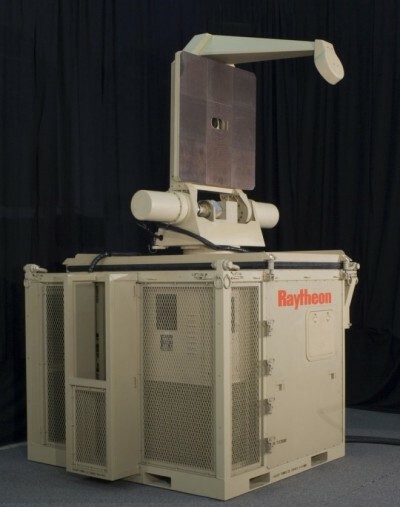 The sale is mentioned in a presentation by Raytheon, who built the microwave weapon for the Defense Department. The so-called “Active Denial System” works by heating the outer surface of the target’s skin using millimeter waves – short wavelength microwaves. The effect is painful, but generally harmless, and forces the target to get out of the beam. Recently, it’s been proposed as a possible defense against pirates; last month, Raytheon gave a presentation on Active Denial at a NATO workshop on anti-pirate equipment and technologies. This presentation mentions an “Impending Direct Commercial Sale” of a commercial version of the Active Denial system known as Silent Guardian (pictured). This is Active Denial in a box, a 10,000-pound containerized system that can be mounted on a ship, a truck, or a fixed installation. It’s got an effective range of about 250 meters. The beam has a power of around 30 kilowatts. The anti-pirate presentation shows how a set-up with two antennas could achieve almost 360-degree coverage for a small container ship. The Active Denial System was first unveiled in 2001, but a series of delays have prevented it from being fielded in spite of requests for it in Iraq. Danger Room reported the wranglingin 2006 and in 2008, with the Defense Science Board conclusion that deployment was “not politically tenable” because of a possible association with torture. This would be particularly true if the weapon was used at detention centers, and a recent Government Accountability Office report indicated that the attempts to get the ADS to Iraq have now been discontinued. Paradoxically, it seems that the controversial “pain beam” may be more acceptable in the civilian market than in the military – depending on how the weapon is used.